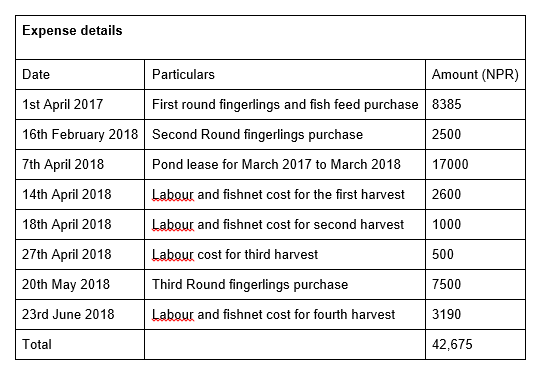 A year ago, if you had told the fishery group that their first sale alone would amount to almost Rs 10,000, it would have felt like a distant dream. 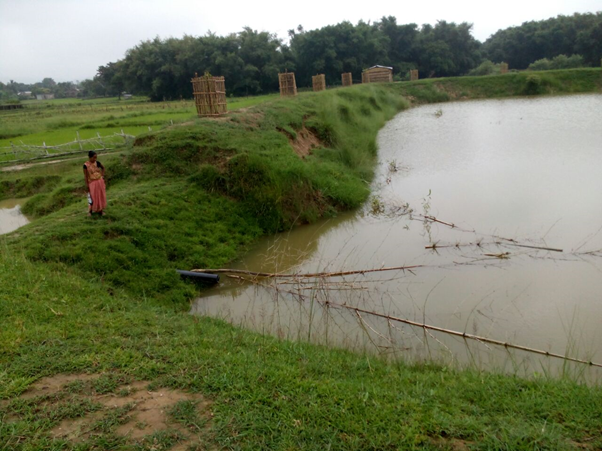 The group formed when members of crop-farming groups established in Saptari under the DSI4MTF project decided to organize themselves into a fish farming group with the aim of diversifying livelihoods. While crop-based farming has been a livelihood activity for a long time in Saptari, Nepal, these farmers tried their hand in fishery for the very first time in March 2017. The group of 14 women and 1 man formed a Pond Management Committee and agreed upon lease terms with the landlord, a fish feeding schedule, and construction of a bamboo house to guard the pond at night. After two training sessions led by the fishery officer from Department of Agriculture Development Office (DADO) Saptari, the group purchased fingerlings of different species (Rehu, Naini and Common Carp) from a fish farm in the neighboring district of Lahan and put them in the pond, a rehabilitated surface water pond already located in the village. Unfortunately, despite the well coordinated work among the members, the continuous and heavy monsoon in 2017 led to gully formation and soil erosion, severely damaging the pond intake. The members learned early on that the true test of collective action is during such uncertain times. In response, the Pond Management Committee organized a meeting and carried out urgent repair work. Farmers gathered together and worked for two days to divert flood water to avoid further damage. They added soil in the intake area and installed two 6-inch diameter polythene pipes to channel the water into the pond. Support from the Department of Irrigation at Rajbiraj and the landlord were crucial. Farmers contributed labor and got material cost support for the piping through reimbursement by the Department of Irrigation. The landlord provided the necessary soil for repair work. Although the investment and revenue are almost the same at this point, it is encouraging that the group has reached a break even point at this stage in their first season. More sales are anticipated in coming days, and they have also initiated conversations with a trader in order to access a larger market for future harvests. 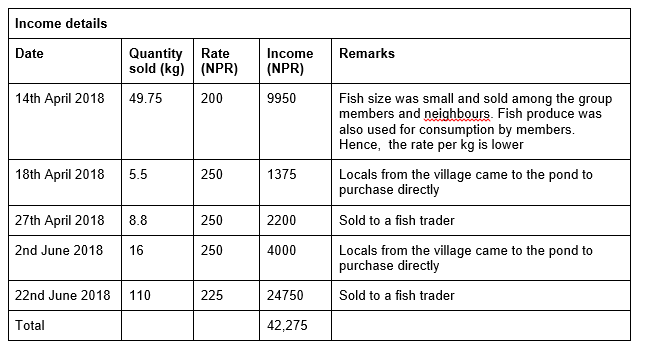 Moreover, some of the income benefits are not captured, such as some of the fish the members personally consumed (and, therefore, did not need to purchase elsewhere). The group has come a long way since the pond damage in 2017 monsoon and farmers are excited to move forward. They have already collected Rs 500 from each member to purchase the next batch of fingerlings.